All of our clients are Mac based and the only windows boxes we have are the servers. I've never run additional widows updates on my ISIS servers. I also don't have them on the internet, but can get to them via VPN if needs be. This is the first real probelm I've had, maybe it's from a virus? Unfortunately, running these updates haven't made a difference. Error: Product server type could not be determined from part number "9935-65144-00" and attempts to do this 5 additional times, reporting the same error. Would I be able to just clear the config within the megaraid utility before proceeding with the restore from the USB key or should I just leave it? Both of these systems are dongle based servers and both dongle light up as if they're working, but aren't being detected. Where can I find updaters for my Dongles? I've looked under My Products tab and don't see any ISIS servers under there. Not for these servers or my 5500s. I've tried adding the dongles system ID's to my account using the approprite link but have the error: System ID is invalid or already under an Upgrade & Support plan. Please specify a different System ID. That profiler indeed looks 100% ok.
What was the upgrade path you followed? The system should recognize your dongles. Can you check their content with donglemanager on a media composer system? I would remove your system id's from your previous post by the way. You can use Dongle Manager to check your dongles. 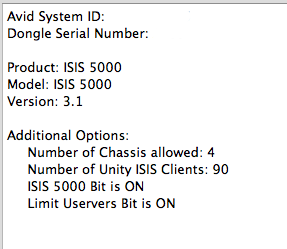 There's no update required to run updated ISIS versions. 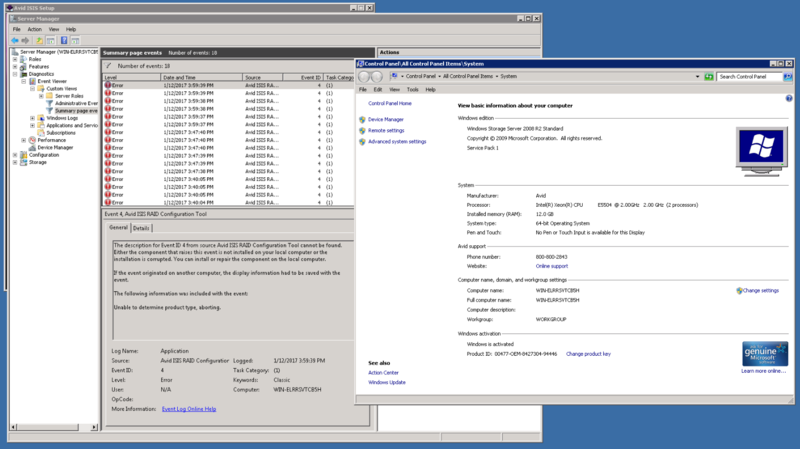 What does the System Director Memory Log Viewer display? Donlge manager reports this on both. ID removed for the post: I've also X out the previous post. Cheers. I've been putting off re-imaging this machine but I think it's time to give it a go. 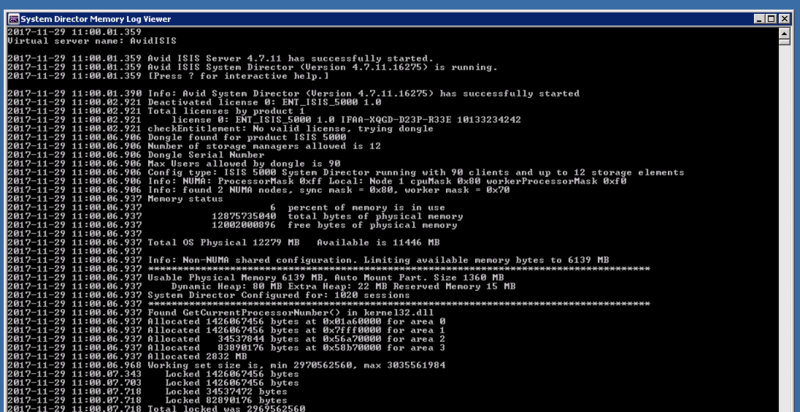 Should I remove the Raid config before doing so or just leave it and try? My thinking is i'm better of clearing the config and starting from scratch. If your ISIS is no longer under support, I do not mind having a look through teamviewer. You can PM me details if you want me to. If it is under support I'd advice you to contact support as the ISIS/Nexis support guys/girls are, in my experience, of very good quality. And rename the folder or delete the files here. Was this ever using a software license? What does the Avid License control show? Day before last, I moved a lisence from a working 5500 onto this one thinking it may have been an issue with the dongle not being recognised. After trying that and it not making a difference, i deactivated it. Once I deleted the lisence data you mention, System Directory Memory Log Viewer no longer shows the Deactivated lisence. The problem still existist so I'm going to reimage this machine to day and start again. I'll update the post in a few hours time. There's obviously some undocumented piece to this puzzle that i'm missing that is stopping these from working. I'll figure out how much a single support case would cost me, in order to get my hands on this information. Jeroen if your reading this, I might take you up on that offer if it's still available? I won't PM you until I hear back. Thanks..
Can you also post a screenshot of the MegaRAid utility showing the logical volumes? And sure I don't mind having a look. PM me whenever you want. Did you download the Avid installer again and use that? It seems the raid exe file is broken. Yes I tried installing again from a new downloaded version of the installer, with the same results. Indeed the raid installer isn't working, not because of corruption, but because of this 'unknown product type'. No where online can I find information on how to address this issue. The installer script fails to run and execute with the same original error: Product server type could not be determined from part number "9935-65144-00"
I thought this number was Avid ISIS lisence not being seen, not the case. Then I thought maybe it was because windows wasn't registered, not the case either. That looks pretty normal as well. Let me chack my mailbox.